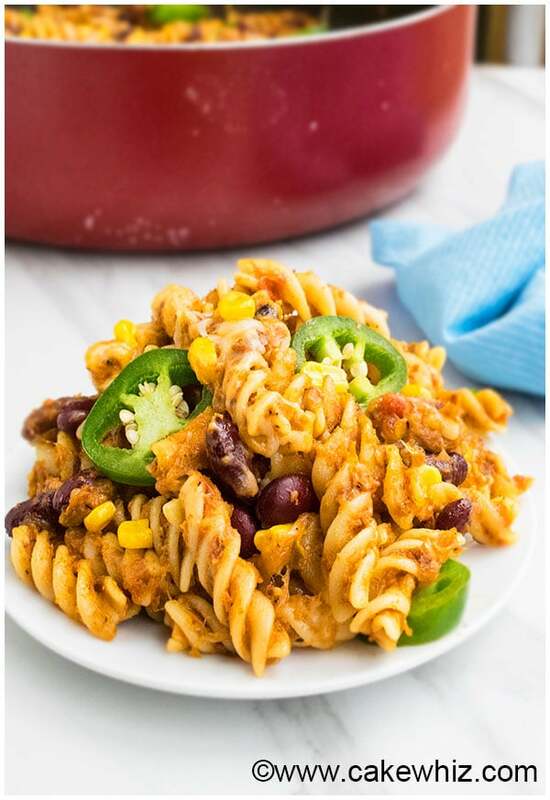 This quick and easy one pot taco pasta recipe is a great 30 minute meal, requiring simple ingredients. Packed with Mexican flavors, beans, beef and cheese! This one pot taco pasta recipe was one of my FAVORITE meals, while growing up. Honestly, I love how my mom makes the most INCREDIBLE meals without spending hours in the kitchen. This is one of those EASY 30 minute meals that requires no mess or fuss. Everything comes together in one pot, which means no extra pots and pans to wash. It has all the flavors of MEXICAN tacos but in pasta form. I, personally, love meatless taco pasta with beans, corn and salsa BUT you can easily add whatever meat you like. Whatever you do, DON’T make taco pasta with egg noodles. I made that mistake and it was a mess! Only use regular rotini pasta- NOT whole wheat pasta because that takes longer to cook and the quantities of ingredients in this recipe would have to be adjusted. You can also easily adjust the quantity of beef, corn and beans, based on your preference. You can make taco taco pasta without meat (no meat), by just omitting the beef in this recipe. You can also replace beef with boneless chicken cubes and make taco pasta with chicken. Similarly, you can replace beef with turkey and make taco pasta with ground turkey. You MUST use salsa! Honestly, taco pasta with tomato sauce or pasta sauce is just not the same! It lacks that Mexican flavor. I prefer using mild salsa but you can use the spicy version too. You can also make RICH taco pasta with cream cheese by mixing in 1/4 cup full fat cream cheese into the pasta, just before adding the toppings. Do not skip the cheese! Last week, I made “healthier taco pasta” with no cheese and it was awful! You can make taco pasta with Doritos too, which adds a little CRUNCH in each bite. Yum! Just toss some roughly chopped Doritos on top of the pasta when it’s ready. Remember to serve immediately or else the chips will become soggy. Additional taco pasta TOPPINGS include: lettuce, sour cream, sliced jalapenos, avocado slices, additional salsa, cilantro. 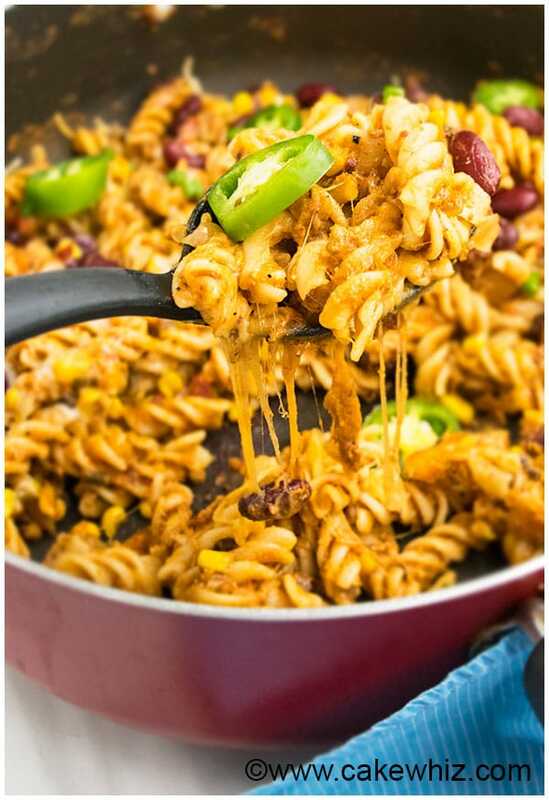 How to make one pot taco pasta? The process is very simple. Start off by cooking the ground beef. Then, add taco seasoning, beans, corn, salsa, water and uncooked pasta. Mix it all together. Cover with a lid and cook until the pasta is tender. Finally, sprinkle shredded cheese and garnish with your choice of toppings. 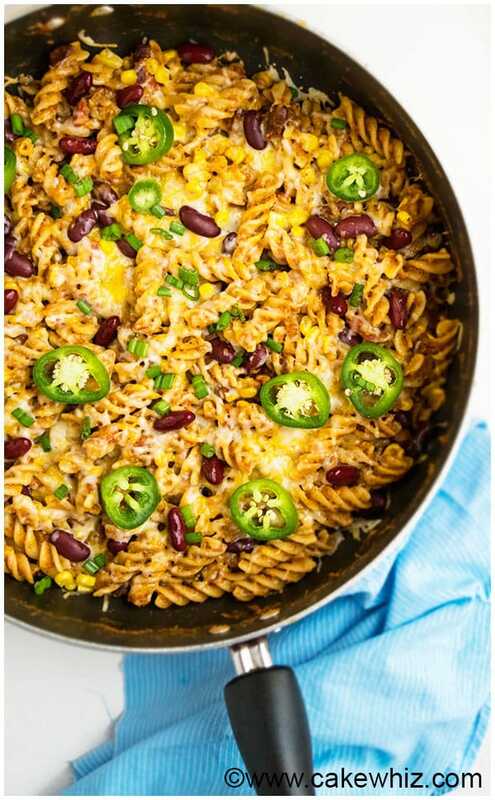 How to make taco pasta bake? The baked version is different. You need to use cooked pasta and everything needs to be assembled in a tray and then it’s baked in the oven for a little bit. I will be sharing a recipe for that soon. My recipe today is NOT for that. 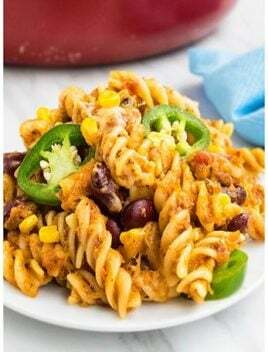 This quick and easy one pot taco pasta recipe is a great 30-minute meal, requiring simple ingredients. Packed with Mexican flavors, beans, beef, and cheese! In a wide non-stick pot, heat some oil on medium high heat. Add ground beef, ginger paste, garlic paste, salt, pepper and mix it together. Cook for a few minutes, while stirring occasionally until the beef is thoroughly cooked and the excess liquid evaporates. You can also drain the excess liquid, if you are in a rush. Add red beans, corn, salsa, taco seasoning, uncooked pasta, water, additional salt and pepper (if needed) and mix everything together. Bring everything to a boil. The, cover and let cook for about 15 minutes or until the pasta is fully cooked. If the mixture is getting too thick and the pasta still needs some time to cook, add a little more water (no more than a ¼ cup). Then, cover and cook for a few more minutes. Remove from heat and sprinkle shredded cheese, which will melt in about 2 minutes. Garnish with additional toppings of your choice and enjoy! Okay YUM! I never thought to put Doritos on pasta, but it works in this recipe. And my kids LOVE the idea! This looks like one of those comfort meals that my family would go crazy over! !